Showing you more of this quilt totally skipped my mind until yesterday when I was literally smooshing it into the “quilt” closet. This quilt came about because I wanted to do a girly quilt with dresden plates. Original I know. But… wouldn’t it be cute on a toddler bed? With those little dresden plates going across the bottom of the bed all in a row? Gheesh I need a girl. That is a really cute quilt. Congratulations on having the Fatquartershop sell your patterns. I read on their blog that they ran out in the first week. 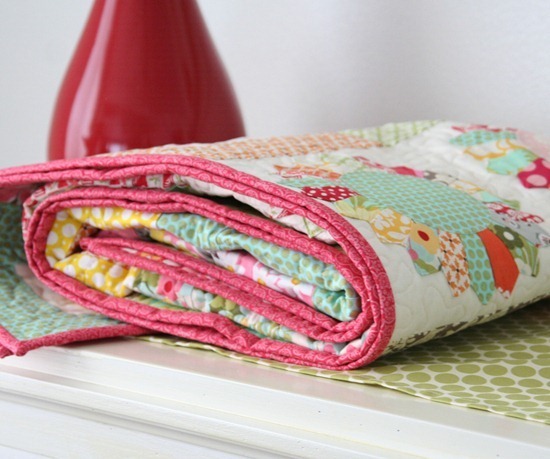 Cute cute Dresden quilt Allison! I want to see this quilt closet!!!!!! The Dresden plates are remarkable!!! Congratulations on going to the Sewing Summit and for your patterns at Fat Quarter Shop. The above quilt is so cute and maybe I will try the Dresden someday! Keep up the good work! Sugar Dish is my next pattern. I love your quilts! Congrats on being in the FQ store, that's cool! that's gorgeous! 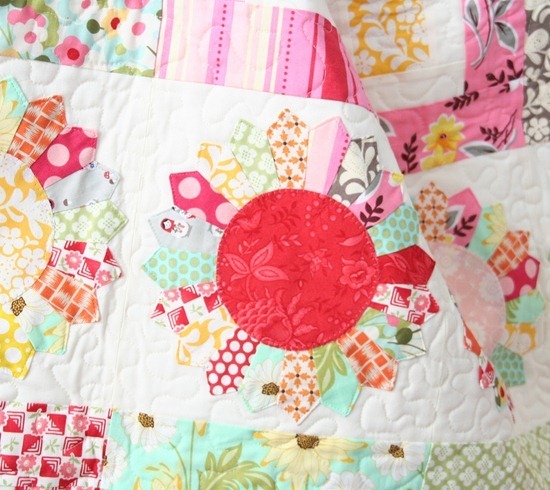 i love how you are able to combine so many different colors/patterns/fabric lines into one quilt. i need to be better about that. Oh my goodness it is just stunning. I LOVE IT. I'm in LOVE with this quilt! It's so cute – I love it…love the little row of Dresdens! Dresdens scare me but I want to try! 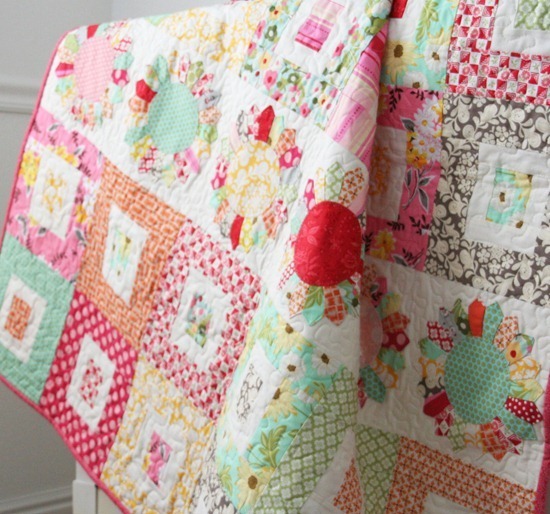 I LOVE this quilt…..if you decide you don't have room for it, it can come live with my 2 little girly girls! As soon as you posted your pattern, I ordered it. Man, do I love PDF instant gratification! I'm doing it in Parisville, but I sure love your fabric combination. Love this quilt! I've been wanting to do a dresden for quite awhile now. This version is adorable! I just adore this quilt! I wish I had a little girl to make this for too. Luckily I have friends and family with little girls so this is a must make! It's beautiful! 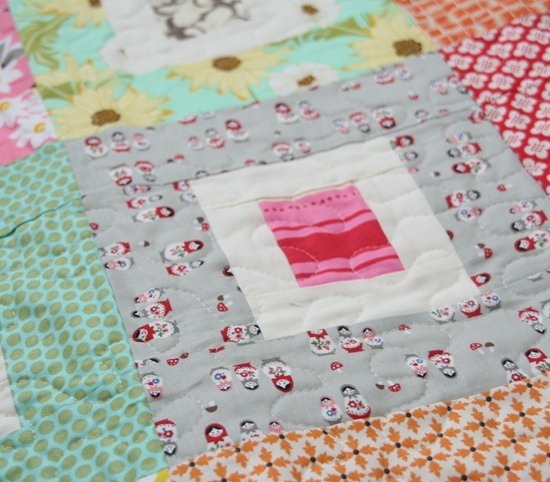 I love how today's fabrics make traditional quilt blocks look new and fresh. I wanna see the quilt closet too – I bet it's quilty heaven! Wow, beautiful! Those dresdens are AMAZING! LOVE! Congrats on the interview with Fat Quarterly. Love your patterns! your quilts are absolutely stunning. i bet if you had (have) a girl, your sewing/crafting projects would explode out of control. :) not that i would know since i only have a boy so far…but i've noticed among my friends that they only start pulling out (or buying) the sewing machine once a girl enters the family! This quilt is lovely! So cute and feminine! The quilt looks great! It is girly, without being obnoxious! I don't like a whole quilt of dresdens, but they look so fresh and modern in the midst of the squares. Brilliant design. Love it!! Just finished my raw edge circles quilt based on your tute, by the way. You have a closet stuffed full of quilts??? Oh I love the flower one! So adorable.